Today has been a hard day. I managed to coax all 4 of the kittens into the house with the food, and trap them in. The 3 originals were easy to get into the carrier, but the beautiful tabby boy was NOT having any part of being handled, and tried to get out the closed door, and then made his way into the kitchen and tried to go out the window that he usually sits in. 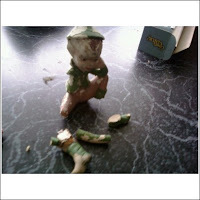 THAT was a mess, he took out my pink ceramic parrot from Campo Verde, and my little elf man that had survived 1 leg/hand amputation & reattachment. I had planned to clean him up and repaint him, because I do love him, he is older than I am, and spent MANY years sitting in a potted plant at my grandmother’s house, then at Mom’s. He’s now had his leg/hand amputation reamputated, his arm amputated to match that leg/hand, and had his other foot amputated, and chips are everywhere. *sigh* yeah, I think he’s going in the trash with the ceramic parrot. It could have been much worse, the crock from the large crockpot is still on the counter, the butter bell survived, and so did the garlic cellar. I eventually gave up and just opened the door to let him back out, and haven’t seen him since. I cried all the way to HSNT. I know that they stand a better chance there, probably, than at one of the city shelters, and I have a friend who works there, and can help be sure they find homes. The little tuxedo boy and the girl (lynx point) have already been vaccinated and taken to pet adoptions. They are both sweet, handleable kittens. She is much more of a cuddler than he is, but both allow themselves to be picked up and petted without putting up a fight. The grey is personable, but still pretty feral, he’s a flirt, and wants someone to talk to him, but doesn’t want to be touched, and is, of those 3, the mighty hunter… he regularly brought snakes and birds to the porch to show me, and there is a woman in the area who adopts cats to control critters around her barns, and he has a home there. I realize that this is the best option for them, but it was terribly hard for me to give them up, I suspect largely because they’ve been such a little spot of joy in my world lately, when it has seemed otherwise very dark. My situation is forcing me to give up so much, both physical possessions, but also my independence, and my lifestyle, and giving them up is one more thing that I am having to give up. I’m not nearly done packing, but most of what MUST go with me is packed, other than electronics that I’m not going to disconnect until the morning of the move.